Dean Austin believes he has the chance ‘to do something special’ at Sixfields after he was officially unveiled as the new Cobblers boss. The 48-year-old faced the media at Sixfields on Tuesday morning, three days after the club announced him as Town’s new manager, having signed a two-year deal to be Jimmy Floyd Hasselbaink’s successor. 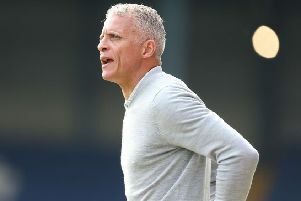 Austin is taking charge of a team that has just suffered relegation to Sky Bet League Two, with the former Watford and Southend United assistant boss unable to stop the team suffering the drop in his five-match caretaker spell following Hasselbaink’s sacking in April. Having been at the club since September, Austin is all too aware of the Cobblers’ potential, and despite the disappointment and obvious setback of relegation, he believes the chance of becoming the manager at Sixfields was something he simply could not turn down. And Austin also revealed he had offers on the table to work as a coach or assistant elsehwere, but he wanted to take on the challenge of being his own boss after 14 years as a coach or number two. “I have really enjoyed my time here, I have met some lovely people, some special people, and I have made a lot of friends,” said Austin, who was brought to the club by Hasselbaink last September. “My main thing is that I believe there is an opportunity to build something here. “I could have easily taken an easy option this summer, not been here, and gone into another role. “That’s not me blowing my own trumpet, but it would have been easy for me to do that, but I think this is a smashing club. “The last four or five weeks of the season, the fans really supported the team, and the backing they gave me and the team made me feel there is an opportunity to do something special. “That is why I am here today. “Potentially there was stuff for me, and I could have easily waited four or five weeks and gone on to another role. In his five matches as caretaker, Austin secured seven points from two wins, a draw and two defeats, and he also transformed the way the team played. They were much more attacking than they had been under Hasselbaink, and the players seemed to respond to Austin’s management. His performance was enough to persuade chairman Kelvin Thomas to hand him the top job, but Austin knows the really hard work starts now. “The chairman and the board obviously think we made a bit of an impact, and I think that we did, but we have a lot of work to do now,” said Austin, whose only previous managerial experience was with non-League Farnborough in the 2004/05 season. “I don’t know what I am going to bring, but when you become the manager you upset players, because you have to leave them out of the team. “The onus is on you, and the decision making is down to you, so that’s where the main difference is. Austin now has a full summer to prepare for the start of the new season in early August, with the squad set to return for pre-season training in the final week of June. But the former Tottenham Hotspur and Crystal Palace defender admits he can’t wait to get stuck into the task of getting the Cobblers back into league one. “I am excited, and I wish the season or pre-season was starting tomorrow,” said Austin. “I am really looking forward to it, and it is the planning stage now for me and the staff.